The other half of a patriotic set of two (Stars & Stripes), Starstruck: Blow My Heart Up is set to recording artist Lady GaGa's hit single of the same name. 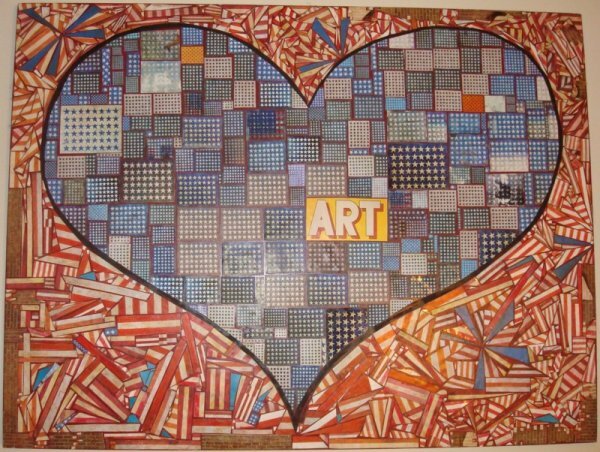 I pieced the giant mosaic together using a variety of renderings of artist Jasper John's iconic pop art American flag, only fragmented and cut into a wide and random array of shapes. The stripes of Johns' flag comprise the background of the piece while the fifty stars of the flag repeat over and over inside the confines of the heart. The result is a heart that's essentially bursting with stars. Some of the flag images came from fine art books, but the majority were printed on my home printer, treated and distressed with water or photoshopped to add visual variety of color and scale to the overall piece. I can equate the process of making Starstruck almost to putting together the pieces of a huge puzzle; the final image was already there, I only had to figure out the right fit for each piece until no gaps remained. Like Stars & Stripes, Starstruck: Blow My Heart Up is intensely patriotic, a re-imagined American Flag and a tribute to pop music and pop culture at large.